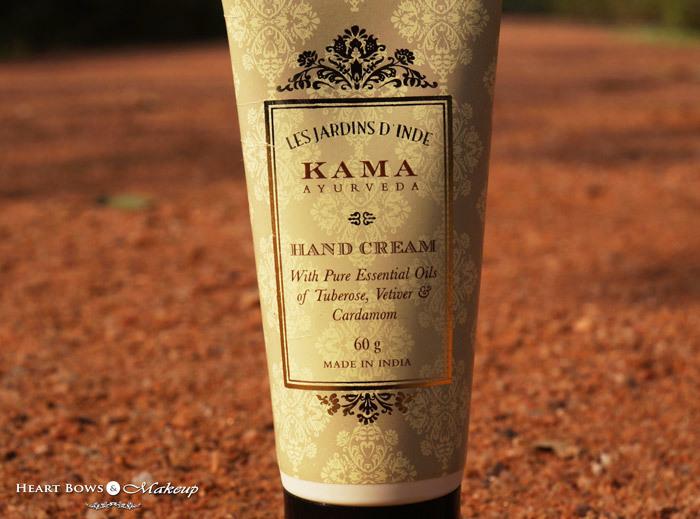 Home » Hand Creams » Kama Ayurveda Hand Cream Review: The Best Hand Cream for Dry Hands! 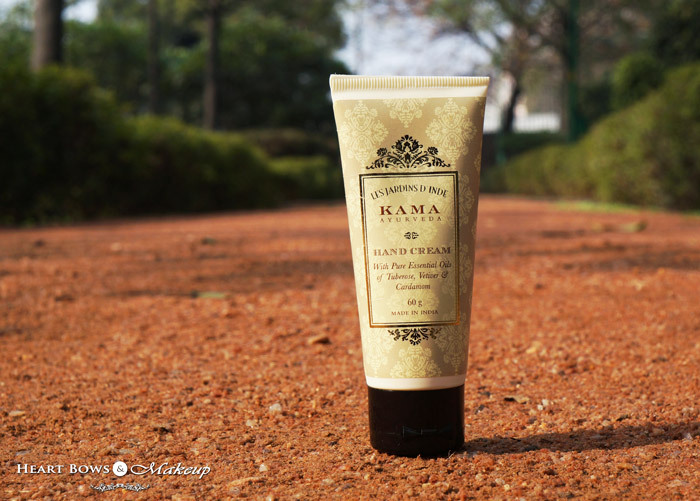 Kama Ayurveda Hand Cream Review: The Best Hand Cream for Dry Hands! A good nourishing hand cream is a must have in everyone’s kitty be it in summers or winters. I loving experimenting with different brands and I recently started using the Kama Ayurveda Hand Cream. I’ve always had a great experience with the brand’s products before so my expectations were quite high with the hand creme as well. Read on to know if this is worth a buy or not! Also, don’t forget to read the review of the Kama Ayurveda Nalpramadi Thailam which I found to be a great and cheaper alternative to their much raved about Kumkumadi Oil. An Enriching Hand Cream made with 100% Organic Cold Pressed Sweet Almond Oil & Organic Cold Pressed Coconut Oil, nutrient-rich with fibre, Vitamin A, E and minerals relieve dryness, nourishes and rejuvenates the hands and cuticles. Blended with Shea Butter, Cocoa Butter and Kokum Butter which helps to regenerate skin cells & absorbs deeply forextra smooth touch. The Kama Ayurveda Hand Cream comes in a cream colored tube with gold detailing. It is packaged in a similar cardboard box which mentions all the necessary details like the product claims, ingredients, date of expiry etc. 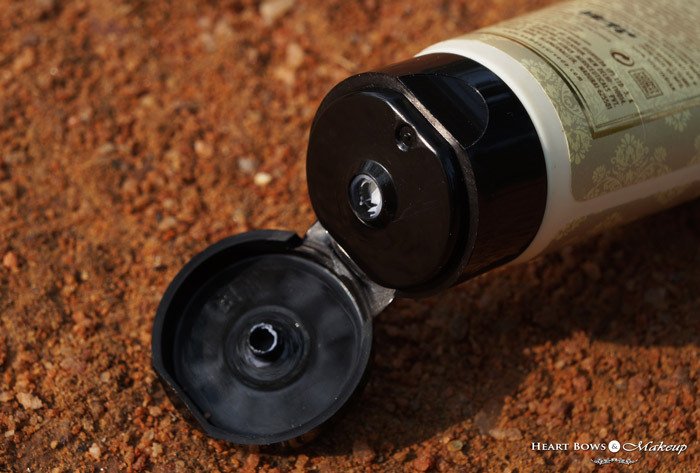 The black flip open cap shuts tightly hence you can easily carry it everywhere with you in your hand bag. From their stores to the packaging and the actual product, Kama Ayurveda products have a regal touch to them which makes them all the more attractive. Talking about their stores, have you visited the one in DLF Place, Saket? Its one of the prettiest and fanciest stores I’ve seen and you almost feel you’ve been transported to another world. Coming back to the hand cream, it has a very creamy texture which is really hydrating. It will moisturize and nourish the driest of hands without feeling greasy or oily. Since the texture is rich, the hand cream by Kama Ayurveda needs to be massaged for a minute or so for it to get absorbed properly. Once absorbed, it does not leave any oil stains like some hand creams have in the past, especially on my laptop keys. ughh. This is easily the best hand cream for dry to very dry skin and a must have for winters. Talking about the ingredient list, it contains organic and nourishing ingredients like sweet almond oil, virgin coconut oil, shea butter, cocoa butter, kokum butter etc. No wonder my hands feel extremely soft and nourished everytime I apply it. It showed results from the first use itself, which is pretty amazing! For me, the scent of a hand cream is as important as the efficacy. Though I love floral scents but this has a beautiful mix of cardamom and tuberose which smells so different and totally won me over. 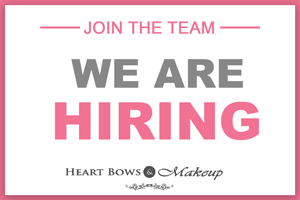 Its light and not too overpowering, perfect for sensitive noses! I have loved my HG Neutrogena Hand Cream for ages but I think it has a strong contender. If I compare these two, I think Neutrogena variant is great if you don’t want to spend alot on a hand cream but if you love rich and hydrating hand creams with a beautiful scent then the Kama Ayurveda Hand Cream is your best bet! 4.5 / 5(Reviewed by Lisha B. 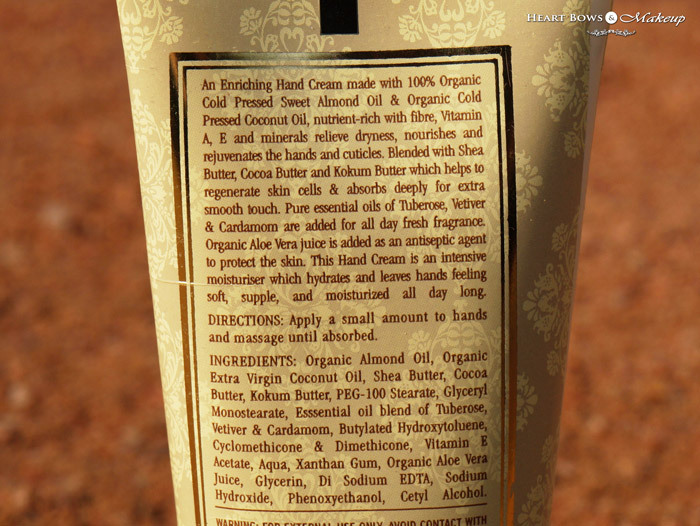 )Kama Ayurveda Hand Cream Review: The Best Hand Cream for Dry Hands! HBM Recommendation: Kama Ayurveda Hand Cream has a rich and creamy texture which instantly hydrates dry hands. This nourishing hand cream shows results from the first usage itself and does not feel greasy. The beautiful and light fragrance is just the icing on the cake. Highly recommended for all hand cream lovers!